Revolabs today announced that its next-generation Executive Elite™ wireless microphone system has been integrated into the large multipurpose meeting space in the Big Ten Conference headquarters and conference center in Rosemont, Illinois. Installed by Frequency Audio-Visual Services, the best-of-breed microphone solution is renowned for its ability to capture speech levels from a distance while keeping ambient noise levels extremely low, allowing the Big Ten to provide incredible audio intelligibility for meeting participants within a challenging acoustic environment. 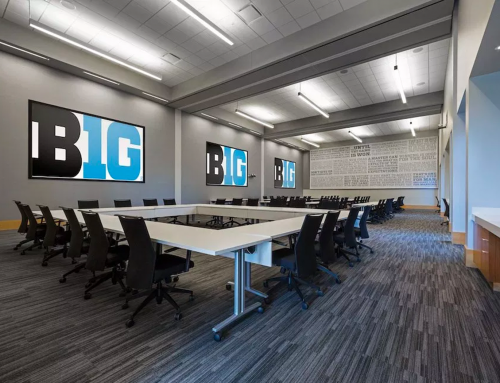 The Big Ten’s new multipurpose room was created to accommodate meetings with more than 100 attendees, featuring videoconferences and presentations. 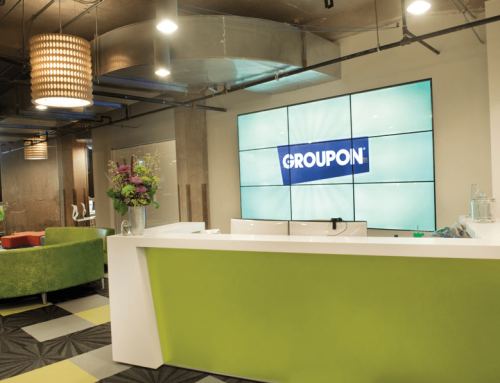 With high ceilings and a low-profile speaker system, the approximately 75 foot long, 40 feet wide, and 25 feet high room required a microphone solution that could easily satisfy the space’s various furniture arrangements as well as voice lift and conferencing requirements. 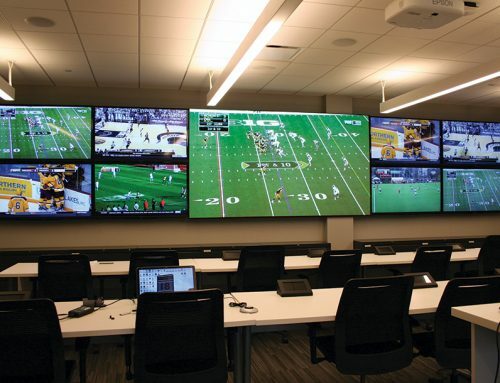 By installing Revolabs’ next-generation Executive Elite wireless microphone system, the organization gained a powerful solution that combines robust audio quality, secure communication capabilities, and the flexibility to place microphones anywhere inside the modifiable room. Featuring a beautiful form factor and leading-edge audio engineering, Revolabs’ Executive Elite tabletop microphones allow organizations to easily satisfy a variety of application settings, acoustic requirements, and room configurations. Supporting up to eight wireless microphones per system, the solution also allows users to link multiple Elite units easily in order to support up to 44 microphones across large conferencing spaces. Loaded with audio-enhancing technology, the innovative solution uses “Designed for Speech” technology, built-in equalization options, and advancements such as an improved signal-to-noise ratio to provide meeting participants with a best-in-class audio experience.